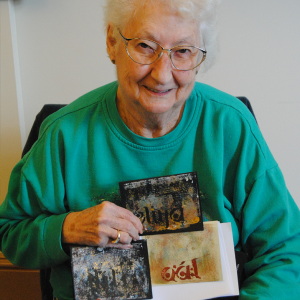 A visitor displays her cards created from the Art in Words workshop. Free two hour parking is available at the Chilliwack Museum. There is a loading zone in front of the building for busses and handicapped parking. The Chilliwack Archives at Evergreen Hall offers free parking at both the front and back of the building. Both the Museum and the Archives are wheelchair accessible.